There is little doubt that the construction landscape has changed; different jobs have different requirements and making sure that you (the tradesmen) are properly equipped is crucial. Truck caps are an excellent alternative to work vans. You have the flexibility to carry a crew, the ability to travel off road when required and let’s be real, everyone wants to drive a truck don’t they? 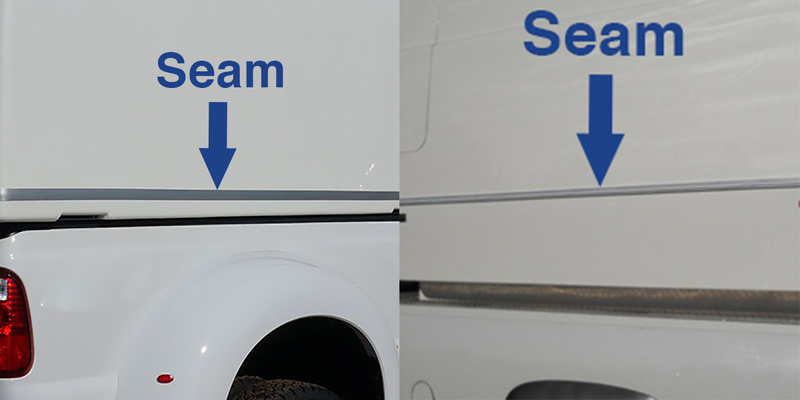 We conducted hours of research to help you decide on one of the truck cap brands. 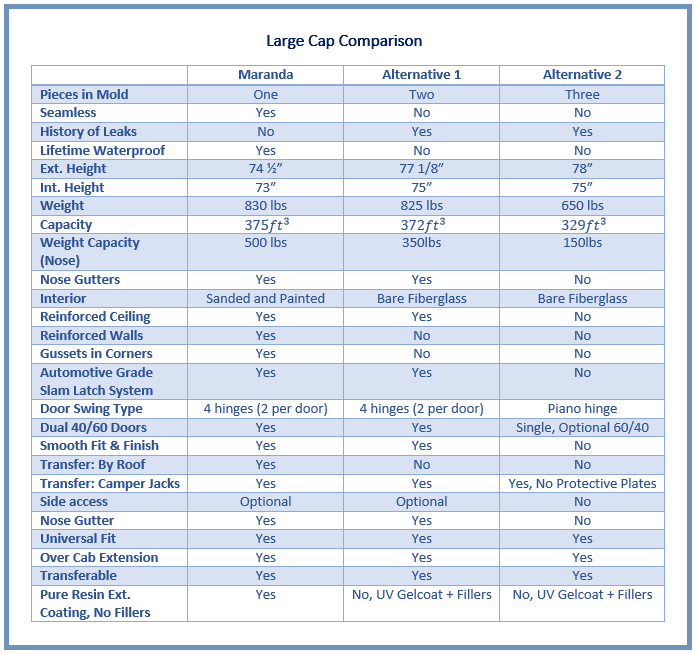 We know that our Maranda caps are king, but we thought we would put a little information together to help show you why. No garbage statistics to try and influence you, just cold hard data. Check it out. The Maranda cap features more structural support beams making it the strongest one on the market. The added support along the ceiling and side walls as well as the gusseted corners fortify the cap to make it nearly indestructible. This is the only cap that can be lifted from the ceiling by forklift without damaging the cap, our competitors tried this and their caps tore apart! Check it out. With a weight capacity of 500 lbs in the nose cone the Maranda is 30% stronger than your best alternative. Why does this matter? You can store items in a Maranda nose cone. This includes that heavy air compressor or generator that’s been taking up valuable space on your previous cap’s floor. When one of our customers hit black ice, spun out of control and rolled over onto their V series capsule, the nose did not buckle or even dent. In fact it appears that this service capsule protected our customer from what could have been major injury or death. The driver walked away from this accident without any injuries. After repairing the ladder rack, they installed the capsule into the replacement truck! The other brands leak, end of story – why? The rubber on the sealed seams dries out over time and compromises the integrity of the waterproof seal. By making the Maranda capsule with one mold, the chance of a leak is completely eliminated. Most people prefer to have windows cut into their cap to improve visibility. It’s important that these windows will only be placed in appropriate locations. In our experience, we know that it creates weak spots when a window is installed in a high-stress area, such as the front of your capsule. When there is a flat window at the front of your capsule it is constantly taking abuse from the elements such as rain or wind. The front windshield of your vehicle is designed to be aerodynamic, service capsules with the addition of windows in the nose, not so much. We recommend that windows are only installed on the sides and back of your capsule. Deciding what brand to offer our customers was simple for us. We chose Maranda because we don’t want our customers to be surprised when their product’s life expectancy falls short. Maranda has done an amazing job at identifying the major and minor issues most service bodies experience and implementing a solid and permanent solution. Now, for a moment, let’s pretend that these weren’t enough to sway your decision… contact us today by clicking the link below for even more reasons to get your Maranda capsule!